Telegram Messenger is a free iPhone messaging app which comes with 1 GB Video transfer, cloud storage, and secret chat feature. This app is available for both Android and iOS platform. The app is completely similar to WhatsApp but with some advanced features. The app is more secure and fast than WhatsApp. It also doesn’t impose any limitation on the data size that can be transferred. You can get the Telegram Messenger app either by searching on the iTunes App Store or by clicking on the link given at the end of this review. To use this app, you need to register with the app using your mobile number. Register with only that number which you genuinely use as the app sends a verification code to the number submitted by you. Your registration will be considered complete only after verifying the code. After registration, the app asks for the permission to sync with your phone’s contacts. Once the permission is given, the app fetches all the contacts from Phone and makes a list of them. Since, I have already mentioned that this app is similar to the WhatsApp so I will not get into the general thing like how to invite contacts, sending messages, doing group chats etc. Instead, I am explaining the features which make it different from WhatsApp. Secret Chat: This is the best feature of the app. 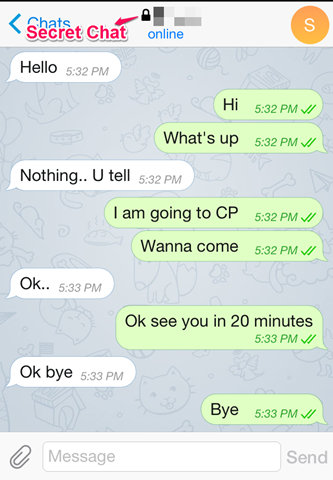 Any chat, which is done using this feature, is not stored over the Telegram servers and it is also self-destructible. It means you can do all your private and secure chats using this feature and without any worries. Absolutely Free: Yes, you read it right. This app is absolutely free and that too without any ads; as compared to WhatsApp which is free for only 1st year of use. Cloud Storage: All the chats, files, media etc. transferred, through this app, are stored over Cloud that too unlimited whereas WhatsApp stores them on your device. It means you can access your chats and other data from anywhere on any device. Secure: Telegram is so confident about the security of your data that it has kept a contest which is always on. In this contest, it is mentioned that if any hacker gets successful in hacking the message sent through Telegram, then he will be awarded with $200,000. Unlimited Media Transfer: There is no limitation on the size of the data that can be sent by using the app, except for the video files which has a limit of 1 GB but I guess, this limit is still very large when we compare it with Whatspp Alternatives. The Telegram Messenger app is a very good messaging app. The interface of the app is exactly similar to the WhatsApp but when it comes to features, then this app is very different, and actually better, than WhatsApp. The app provides you with more freedom and security as compared to WhatsApp. Try this one out yourself and see the difference. 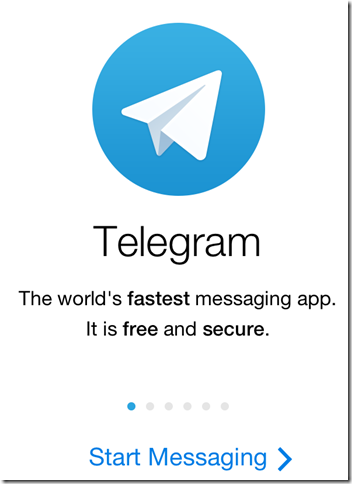 Get the Telegram Messenger app from here.